The Simple Genius brand means fresh design thinking for practical project management apps. Designed and refined by a veteran Project and Program Manager, the SG apps address real-world needs for managers. And with over 100,000 apps sold in 100 countries, SG is proven and trusted on Mac, iPad, and iPhone. 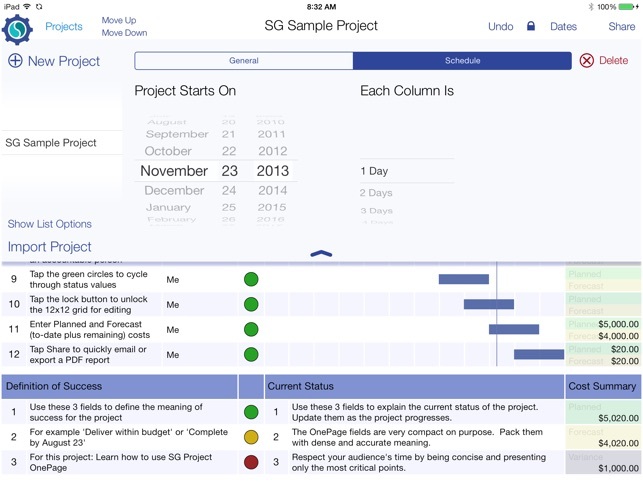 SG Project OnePage is a unique app that allows you to plan and track each of your projects on a single page. The one-page approach is powerful because its constraints force you to focus on what is most important. You and other stakeholders can then quickly absorb the status of the project. It is ideal for keeping your management or project sponsors up to date. As a Project Manager you have a tough job and can benefit from a full toolbox. 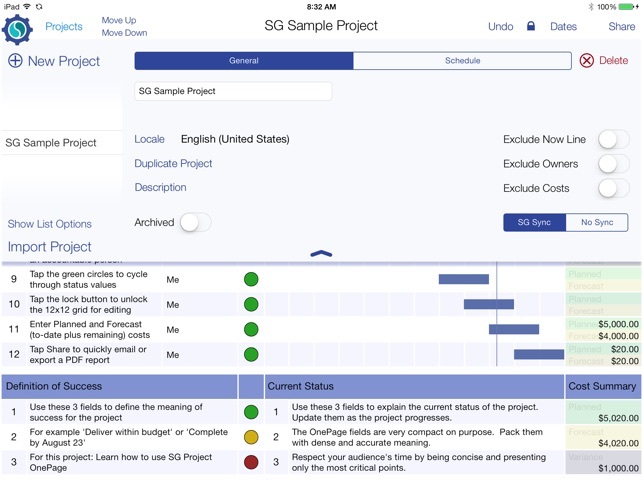 SG Project OnePage is an innovative new tool you can reach for and is most useful for reporting high level status. 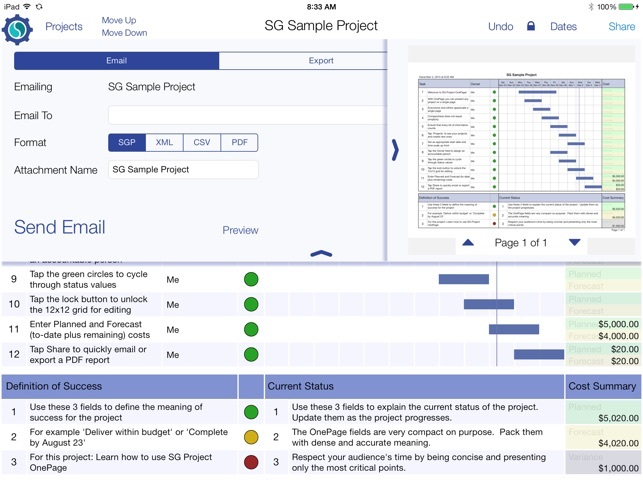 If you are looking for a traditional task planning tool take a look at SG Project 5 or SG Project Pro 5 and use SG Project OnePage as a complementary tool. 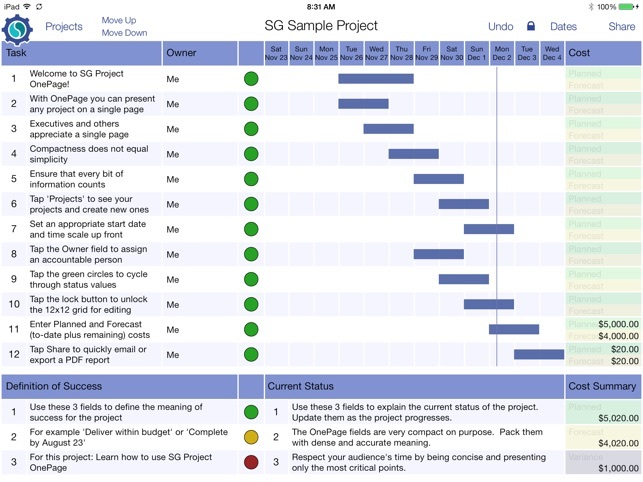 SG Project OnePage uses an approach called 12-by-12 project management, in which every project is broken down into no more than 12 tasks and spans 12 blocks of time. The time scale can range from days to years. So for example one project can be designated to span 12 days, and another project 12 months. The format also supports tracking planned and forecasted costs, and shows a variance for the whole project. You can specify up to 3 goals that define success for your project, and 3 concise (think: "tweet sized") statements that describe the current status of the project. CEO’s, CIO’s, and others who may be reviewing the status of your projects will appreciate the concise, single-page status. 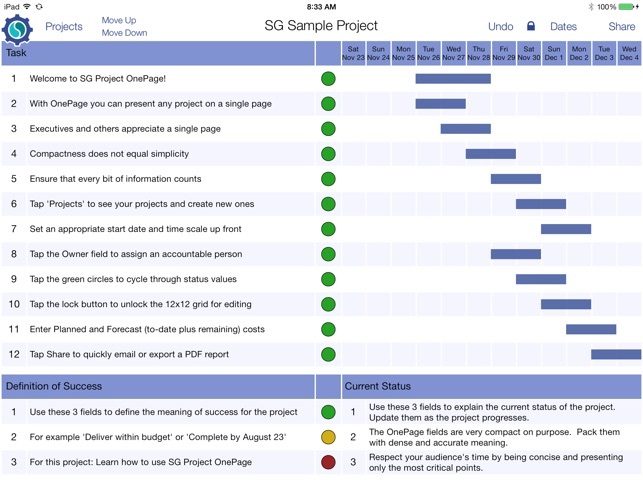 Another great use people have found for SG Project OnePage is to use each of the 12 lines to represent a whole project. At that level it can present an overview of a whole portfolio of projects. SG Project OnePage imports and exports projects in SGP format for sharing with other SG apps, as well as XML format compatible with MS Project. 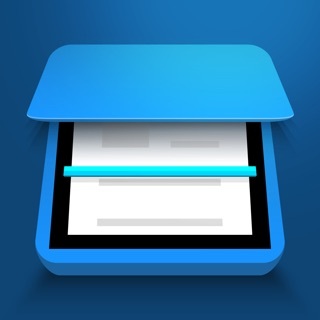 If you also use a Mac, take a look at the companion app SG Project OnePage on the Mac App Store. SG's Dropbox and Box.com integration make sharing easy.